If anyone embodies the promise and spirit of "The New Spain," it is Alvaro Palacios. His L'Ermita is widely considered--along with Peter Sisseck's Dominio de Pingus-- to be the most important Spanish wine in a generation. 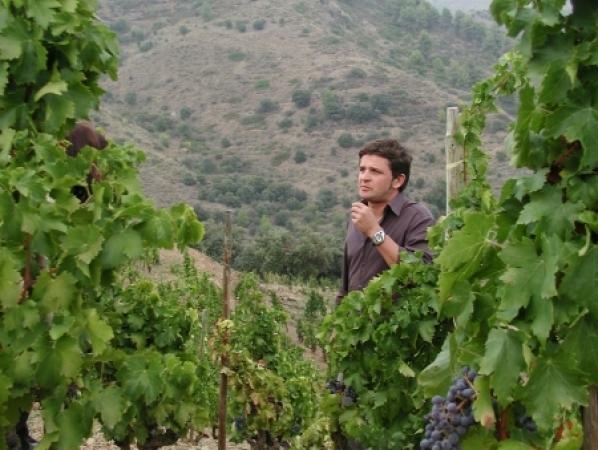 One of nine children born to the owners of Rioja's respected Palacios Remondo, Alvaro studied enology in Bordeaux, while working under Jean-Pierre Moueix at Ch. Pétrus. He credits his tenure at Pétrus for much of his winemaking philosophy and for showing him "the importance of great wines." Alvaro could have returned to the security of his family's domaine. Instead, he was drawn to remote and wildly beautiful Priorat, 60 miles from Barcelona, which had been one of Spain's important pre-Phylloxera wine regions. With its unique terroir of steep hills and terraces Alvaro believed that here he could make a wine that was like a cross between Pétrus and Grange. He acquired his first vineyard, Finca Dofí, in 1990. Then, in 1993, he located what is now regarded as the crown jewel property in Priorat, a precipitous, northeast-facing Garnacha vineyard on well-drained schist that had been planted between 1900 and 1940. Alvaro named it for a small chapel, or hermitage, that sits atop the hill - L'Ermita. Finca Dofí--from Alvaro's original vineyard, Finca Dofí is all Garnacha. Like L'Ermita, Dofí combines power and richness with great breed and finesse. In most Priorat tastings that do not include L'Ermita, Dofí is the clear winner. Gratallops--Alvaro has been instrumental in introducing the Burgundian ideas of Villages and Cru to Priorat. In 2006, he began to elaborate separately a collection of old vineyards from throughout the township of Gratallops to extend and commercialize this idea. The wine is a blend of Garnacha, Carinyena (Carignan) and Cabernet. Les Terrasses "Velles Vignes"--While originally conceived of as a value wine, Les Terrasses "Velles Vignes" has slowly evolved into the essence of what makes Priorat special. Drawing on 15+ years of study, Terraces is sourced from many of the region's steepest and oldest vineyards--many of them north-facing to avoid the intense afternoon sun. With the 2007 vintage, Alvaro acknowledged Les Terrasses' "graduation" by adding the "Velles Vinyes" designation to the label. This wine is a blend of Garnacha and Carinyena (Carignan). The evolving seriousness of Terrasses eventually left room for a new wine, Camins del Priorat. Alvaro had never wanted to be known solely for expensive "trophy" wines, and with Camins, he found the opportunity to create something special. Drawing on his wealth of vineyard sources, Alvaro is aiming to produce a wine that is affordably priced, but which also stays true to his vision of Priorate powerful but elegant, approachable but restrained. The wine is a blend of Garnacha, Carinyena (Carignan), Cabernet and Syrah." James Suckling 91"A firm and silky red with lots of bright blue fruits and violet flower character. Medium body. Vivid finish. Excellent entry level Priorat." Wine Spectator 93 WS TOP 100 2013 Rank 26 "A light texture carries racy, intense flavors in this expressive red, with bright cherry, licorice, mineral, garrigue and spice notes mingling over light tannins and buoyed by lively acidity. Balanced, focused and elegant, featuring a lingering finish.